This photo was taken on December 25, 2016 at 1:23 PM. The location was on a cross street on the National Mall in Washington DC. The "Take It!" 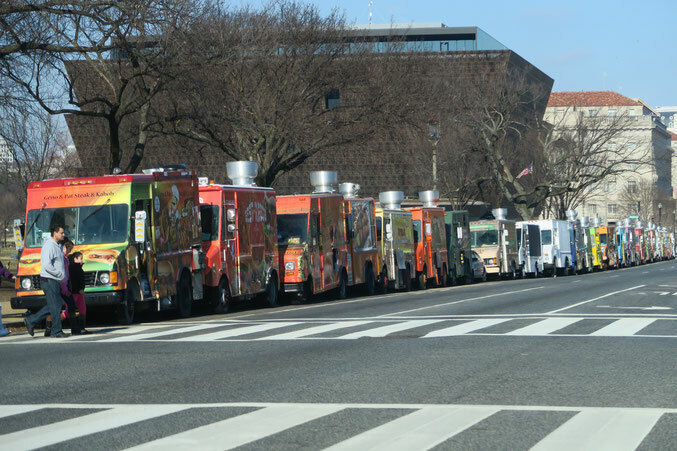 came from my surprise happening upon this line up of 26 food trucks on the Mall on Christmas Day. It was amazing to see this entrapanurial effort to provide food on a holiday when many restaurants were closed, and there were many visitors to the Nation's Capital. As one can see, the day was filled with sunshine, and ever so many people were out and about enjoying the relatively mild temperature. I do not know how it got itself coordinated, but as I slowly drove by the line up of trucks, it appeared that the vendors of desserts were at the tail end of the line. Cool stuff. I hope everyone that made the effort to show up with their food offerings made enough money to feel it was all worth while. While I do not frequent the trucks that much - when I do - I have yet to be dissapointed. The After Take: In the 30 years that I have lived in the area, many changes have taken place in the city. Almost all of them, for the better. The City is now a World Class attraction and our country can be very proud of what is offered as the experience to visitors. If you have not been to our Nation's Capital, I can heartily recomend that you make a visit. It just makes me wonder under what scenario they would all park in the same spot. I mean, it can't be great for business with so much competition sitting around. I had no clue it would be busy on such a major holiday. Was there something special going on? I would think there'd have to be a lot of people in a small area to make that worthwhile.